In our next series, coined “What Went Wrong,” I’ll be discussing recent controversial marketing campaigns and providing an analysis of why I feel they may have failed. My goal of this series is to share my analysis of a campaign so that you can see that even the ‘larger’ brands don’t always get it right and also to give you an opportunity to learn from these mistakes and avoid them when it comes to marketing your business. This week, we’ll look at Pepsi’s Live for Now advertisement featuring Kendall Jenner. If you haven’t yet seen the “canned” commercial, click here to watch it. It’s no secret that the U.S. is currently in a hyper-politicized state. The intended aim of this campaign was to provide commentary on the current social and political injustices in the country. How Pepsi chose to do this though, in regards to their solution to these injustices, is what led to public outcry. Shots from the advertisement appear to mimic Black Lives Matter protests in the United States, with a particularly well-known image of protestor Iesha Evans facing two police officers in Baton Rouge. When Kendall Jenner simply hands a Pepsi to one of the police officers, the outcome is joy and applause; if only solving racial injustices was that easy. Advertisements that choose to make a commentary on societal issues must address them with empathy and sincerity, or risk coming across as tone-deaf, or worse, exploitative. Tip #1: Be mindful and cautious of the stances you take on politically charged issues, even if your heart is in the right place. Celebrity endorsement is nothing new when it comes to selling products or services, especially for big brands. But selecting Kendall Jenner to be the new face of Pepsi proved to not be so wise. While Kendall Jenner has achieved tremendous success in her career, she has also received criticism in the past for appropriating black culture and for copyright infringement. Businesses must be extremely careful that the public figures that represent their brand have not been involved past controversies. These past missteps should have been taken into account, especially in an advertisement that seemed to mimic Black Lives Matter protests. Tip #2: Similar to celebrity endorsement for large brands, you may want to choose influencer marketing as a marketing technique. Before selecting an influencer, ensure the influencer you choose aligns with your values and is free from controversy that may tarnish your brand. In 2013, Pepsi-owned Mountain Dew released an advertisement featuring an injured woman on crutches identifying a criminal from a police lineup of 5 African-American men. The ad was immediately criticized as insensitive towards the serious issues of violence against women and systemic racism in the criminal justice system. It’s crucial that businesses understand feedback and criticism and ensure that past mistakes are not repeated. Tip #3: It’s always important to publicly address negative criticism in the online world. If your business has received a negative comment or review on a social platform or search engine, take some time to respond to the unhappy consumer by addressing their concern and providing any assistance in resolving the manner. That is, of course, if the comment does not contain obscene wording or profanity, in which case deleting the comment would suffice. As a small business, it’s important that your marketing is executed in a strategic manner. As we’ve seen with this controversial story, one wrong move could lead to the demise of your business. Contact the professionals at CreativeWorks Marketing today for assistance with your marketing campaigns! Imagine your business is about to launch a new campaign. You are sending out an e-blast to give your customers 20% off their next purchase. You’re confident this will be one of your company’s most successful ventures to date. On the day of the launch, your office is flooded with emails and phone calls regarding your new offering, and while you’re ecstatic, your team is frantic. But why? While your campaign was crafted to a tee, the internal communications to your staff informing them of the upcoming campaign and its details were non-existent. There are two sides to any marketing campaign. External marketing allows you to get your message across to your intended audience, and internal marketing allows you to effectively market your campaign within your organization. In order for any marketing campaign to be successful, you need to create a plan for both. We all know that running a new campaign can be time-consuming and we get wrapped up in the details and often don’t take the time to keep our staff up to date. In order to ensure a successful campaign however, you’ll need to bring your staff up to speed so they know how they are impacted and what, if anything, they need to do. After working with your marketing team to develop a new idea for a campaign, share it with your staff. If a new campaign is being implemented without staff members knowing all the details, it’s easy to get the message confused. Sharing your ideas for the new campaign will allow staff to prepare, and will also encourage them to contribute their own thoughts and ideas towards the new campaign. After giving your team the heads up about the new campaign, it’s time to get ready to launch. Depending on what kind of campaign it is, you will need to provide your team with supporting materials that will allow them to carry it out as you had intended. For example, if you are promoting a new service for your clients and they are encouraged to call in and inquire about it, prepare a script for your front line staff. If calls should be directed to your sales department, then the person answering the phone needs to know where to direct the call. The more informed they are, the increase in likelihood of a successful campaign. It’s one thing to let your staff know about a new campaign; you also need to follow through with them about it. Ask them how the campaign is going; are they getting a lot of calls/emails/website requests? If your team is dealing with customers directly, you need to communicate with them effectively so you can measure the success of your new campaign. Your campaign has just ended and of course, it was a hit! Share this success with your team. Not only will sharing the success encourage your employees, it will also give you a chance to evaluate what went well, and discuss how you can create an even stronger campaign the next time around. In order to effectively market any campaign to your customers, you need to be prepared to market it internally as well. Keep your staff in the loop when launching your next campaign; you’ll be surprised at the difference it makes. When thinking about branding, we all know that large brands tend to have the financial resources to produce innovative and creative advertising while smaller brands and budgets often have difficulties getting noticed. With this in mind, I wanted to showcase how with some creative, out of the box thinking, a small brand (Queensland Board of Tourism) made a real impact with a low cost approach! 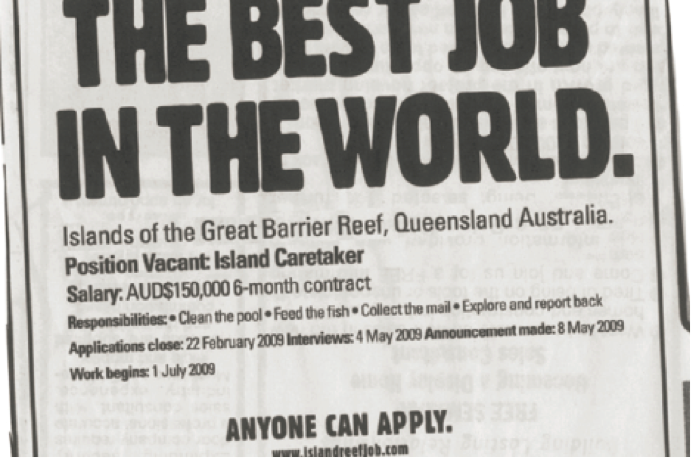 This extraordinary campaign relied on the “Jobs” section of newspapers to get noticed. The result: the Board received over 7 million visitors, 34,000 applicants from 200 countries, and 500,000 votes for this once-in-a-lifetime job. My take away for all SMBs is that you can make a difference and leave an impact with great results if you risk a little, and work with non-traditional marketing channels. Has your SMB ever had success with an out of the box campaign? Or has a radically different campaign backfired for you? Have you wanted to try a risky campaign, but been held back by fear? I look forward to hearing your stories in the comments below.